A few months ago I read this really really great business book which was referred to me by a good friend of mine, Mike Ivey. Mike and I don't always share the same taste in movies ... I loved Shadowlands (he didn't) and he loves the James Bond movie (really now, give me a break ;-) .... but we both agree that this is a fabulously fantastic book. Mike's in the business of consulting and coaching people and assisting business achieve their objectives through their greatest asset, the companie's 'gold' ... it's people. His company's called The Gold Digger ... and I can highly recommend them. The book explains the current age we live in - The Conceptual Age .... The age of THE ARTIST. 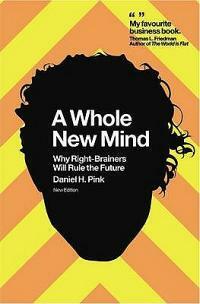 It highlights the value of right brained thinking and the importance for understanding our current context. I loved it so much that I've bought an additional three copies as gifts for others. At the moment, my daughter Andrea's reading it .... and I highly, highly recommend anyone that has an interest in art/life/business to read it .... I LOVED IT.